One of the great joys of having a deck, an alfresco, or any other outdoor space, is being able to wine and dine there, enjoying the fresh breeze and the delightful smells and colourful sensations of your garden. And once you manage to create a dedicated outdoor dining spot, you’d want to spend every sunny minute there, ideally under the shade of a giant tree or a lovely canopy of climbers. For the sake of making the most out of your outdoor space, here are some great tips to get it ready for your summer breakfasts, BBQs, and garden parties. First and foremost, make sure to pick a dining set that has the appropriate size for your available space. Usually, small patios and decks benefit the most from bistro style sets (two chairs and a table). These can also be a great option if you’re looking to create a small corner for relaxing on your balcony. On the other hand, if you’re looking to take family meals and small dinner parties outdoors, a full 6 person outdoor dining set will offer plenty of space for everyone to join in. 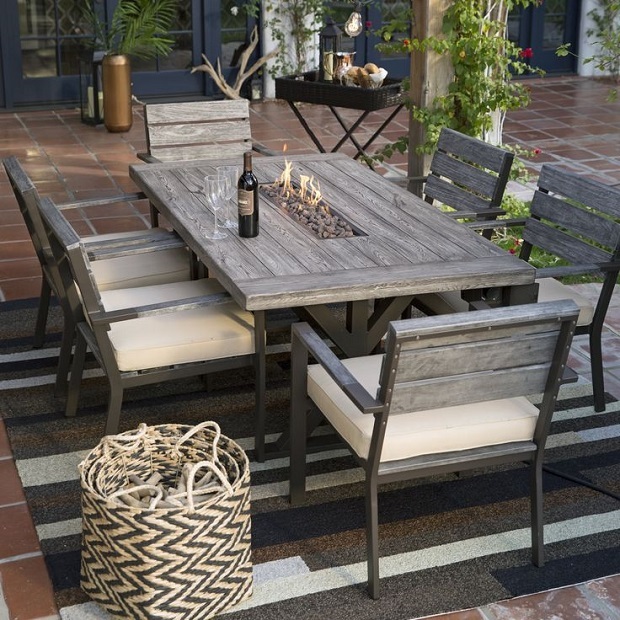 Whether it’s a table set for 2 or a complete 6 person outdoor dining set, it’s important to choose good materials that can withstand the elements and ensure your investment lasts for years to come. If you’re into the traditional charm of wood, make sure to choose durable and sturdy timber, like for instance teak. Teak has a great amount of natural rubber, which acts as a layer of protection against pests, moisture, rot, and sun damage. But if metal is your cup of tea, wrought iron is a more attractive alternative to stainless steal, which is also completely corrosion proof. Your outdoor dining area should be as comfortable as your indoor dining room. Taking some cosy accessories outside is a great way to make your outdoor space more homey. Gorgeous pillows placed on the dining chairs will make the space look more inviting. Many designers also suggest adding an outdoor rug as it will tie everything together and it feels great underneath your feet, helping you unwind faster and just chill. There’s nothing more romantic than enjoying good food and wine under the soft glow of the stars. However, starlight is simply not enough for having a great dining experience. Unless your outdoor dining space is properly lit, you can forget all about late night soirées. Consider adding a string of lights overhead for a more romantic touch, or strategically placed LED lighting to leave a memorable impression on your guests.